It's a strategy game of survival, and these waters can be treacherous! Crowded Waters is a great board game where players try to swim around the board and place tiles head to tail all while trying to not get trapped. If you are the last player that can still swim around then you will be crowned the winner. Fun for almost all ages, families and friends alike will have a blast in this quick yet strategic board game. 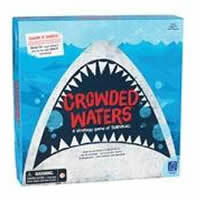 Quickly learn how to play by reading through the official Crowded Waters game rules and instructions below. You'll be glad you picked up this game for your next game night. Make sure to share it with others! You are trying to be the final player with room to swim. If you are, you win. Inside the box you'll get a game board, 88 shark pieces and the official Crowded Waters game rules and instructions. Please keep in mind that the official Crowded Waters board game rules and instructions could be different depending on the game version you have. The rules below are some of the exact directions on how to play Crowded Waters. Share with us your comments, funny stories, tips, advice, strategies, creative ways to play, questions about how to play, problems with the rules or anything you want about Crowded Waters. All submissions will be reviewed within 24 hours. Click here to add your Crowded Waters comments.